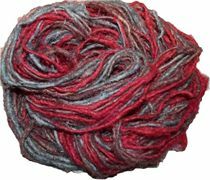 Recycled SILK yarn knits / crochets up really quick, soft, silky and shiny so it is best used for projects like scarves, neck warmers, cowls, shawls, stoles, bags, pouches and cushions. The finished knit or crocheted product will have a strong and firm quality and at the same time has a soft and slightly fuzzy texture. They are great for textile embellishment as well. This yarn is made from recycled 100% SILK yarn left over during the sari manufacturing process. The recycled SILK fibers are handpicked and hand spun in India in cottage industries that I directly source from. No two skeins are exactly alike. 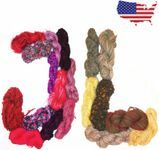 But if you order more than one skein we will send you the ones that are the closest in color.